No amount of teaching will do it. 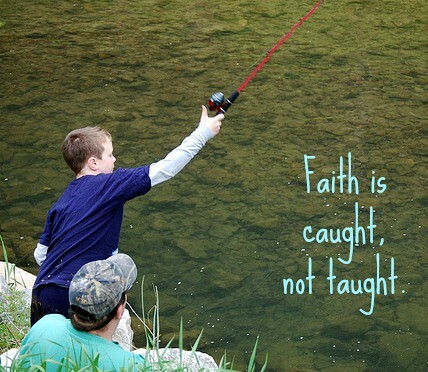 Faith is primarily caught, not taught. They will do as you do. Ask: Where did you see God today? 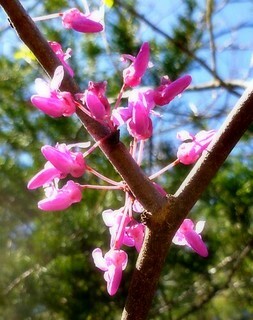 Take notice of God at work and call out his wonderful miracles in creation. If you don’t spend lots of time with your kids, make a point to share a group time of recalling and naming God as a part of your life. When you notice, they will pay attention. Tie life to a Bible story. 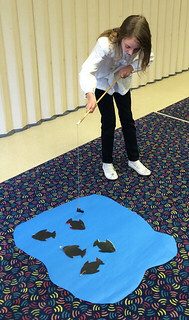 For example, our latest story is teaching us about the miracle of sharing. When more than 5,000 people were fed with just a little bit of lunch, perhaps Jesus encouraged a bestowing behavior? For preschoolers this means labeling sharing as it happens. 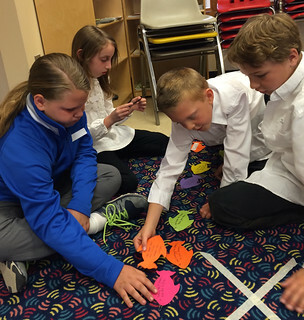 (“You and I are sharing some grapes.” Or, “Let’s share our stories about our day.”) Intangibles — taking turns and working together on a project — are also a form of sharing. Use Bible stories to remind your child of the greater story: Living as Jesus taught. Note: Please don’t bring up this story as an impetus for sharing, as in: “Let’s be like the boy who shared his lunch.” That’s a forced event — a connection that may not be remembered as good! Nurture your own relationship to God. Allow your child to “catch you” at prayer and/or reading the Bible. I have a strong memory of the response of a peer, whom I’d interrupted while praying: “Just a minute. I’m talking to God.” Her reply has stayed with me for 45 years! Model the importance of conversation with, and continued learning about God. At home your rituals probably already include a bedtime routine. Add bestowing a blessing on your child. Rituals within your spiritual community may include regularly serving at L.O.V.E. Thy Neighbor. 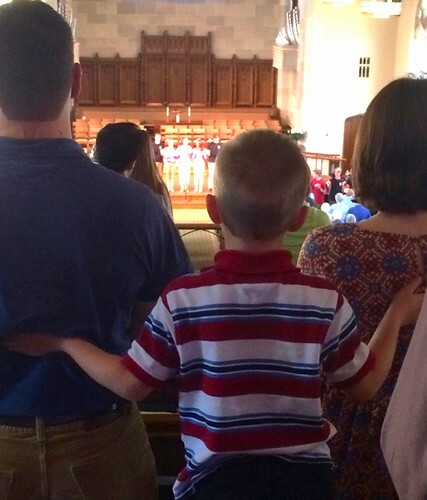 Worshiping together as a family is a biggie. Making time for rituals connect us to God. Faith is caught rendition (cropped and words added) is based on a photo by Virginia State Parks. 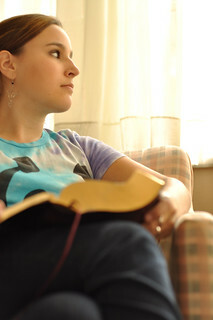 Woman reading a Bible by Ariel Waldman. Both on Flickr under a Creative Commons License. Games Workshop photos by Beth Pascoe. Rest of photos from my archives. ← When you discover who Jesus is, what will you do?